AUSTIN (KXAN) - Bronx, a 2-year-old boxer-mix, is doing much better today than he was on Monday. “He’s real sore, real tender, but the swelling is actually less pronounced today,” said Dr. Matt Schuessler of the Pale Face Veterinary Clinic. Stuck inside Bronx’s head is shrapnel from a bullet fired by a Travis County Park Ranger . “I was kind of shocked that, that kind of action was taken,” said Schuessler. Before Bronx was brought to Schuessler’s, he was with his owner, Stacey Hines, at Pace Bend Park in Western Travis County. “The dogs were taking a break from swimming,” said Hines. 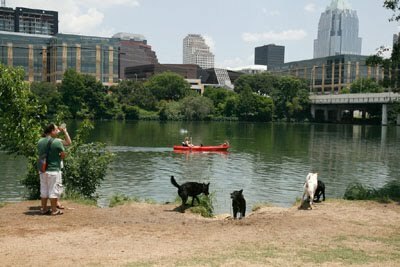 Hines admitted the dogs weren’t wearing their leashes, which is the law at all Travis County Parks, when a Travis County Park Ranger pulled up. “As I’m trying to get out of the water to go talk to him, the dogs run up and start barking at him,” Hines said. What happened next left Hines and her friend in shock. “He [the park ranger] immediately freaked out and ran directly into the lake. I was like, 'What is he doing?' All the dogs are barking at him, and he turned around and opened fire,” said Kenna Bobinger, who was at the park with Hines. Both Hines and Bobinger said a 4-year-old child was nearby when the ranger pulled the trigger. The chief of the Travis County Park Rangers, Dan Chapman, said while a child might have been in the area, at no time was that child in danger. The vet begged to differ.